This bedding set is very durable. I've washed it multiple times and it is in great condition. Bring a hint of casual elegance to your bedroom with this lovely embossed quilt set. Available in a variety of colors, this understated quilt showcases beautiful geometric texture for added style. Complete with matching pillow shams, this lovely quilt set will quickly transform your bed. I am so happy with this purchase! It was perfect for what I needed. First, it is very light weight. This quilt is a topper for a down comforter, so I did not want something heavy, but if you are looking for plush, this quilt might not be for you. I was concerned about some of the reviews that said it looked "cheap". I disagree. It is certainly not a luxury spread, but for the price I didn't expect fine linens. This set is replacing one that was over triple the price (my dogs like to eat my bedding), and I think it is every bit as nice. The other concern I had was color. I ordered the quilt in the King Blue. The color is a little deeper than it showed on my computer screen. It is certainly not a "baby blue"...I'd say it is a little more greenish-gray blue, but it is a very nice color that is close enough to the blue accents in my rug to make me happy. While talking about color, let me also add the quilt is matte...no sheen on the fabric. That works for me, but if you are looking for something with a little shine, keep searching. I can't end the review without talking about the price! Under $*!!! Tremendous value, and I hope that value continues past its first wash. It doesn't have an expensive look. However, I made it work by getting a splashy large silver pillow that is covered by inch-long shimmery silver ribbons. Also it worked great to fold back the quilt to nearly the middle of my bed....because it is super long. This actually looks quite nice and gives it a richer appearance. I like the product very much however the "white" is not a bright white or clear white, there is some yellow in the mix and sadly it looks dingy in my bedroom aside of my other clear white linens. The quality for the price point is worthy and the size of the queen is generous. If not for the color, it would have been a keeper. 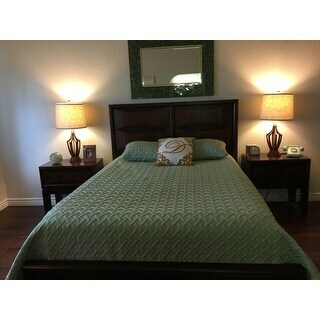 Love this quilt set, perfect color, looks so nice. Love this quilt set. Good quality and very soft. I love the texture on this quilt set, and the color and fabric quality are better than expected. 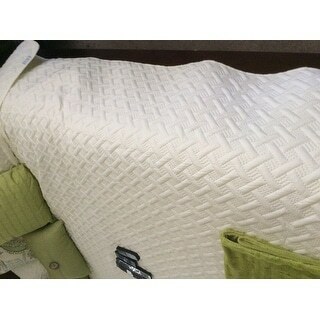 I love the color and texture of the VCNY Nina Embossed 3-piece KING quilt set for my king bed. I bought white. The fabric feels like fine brushed no-iron cotton and washed flawlessly. I paired this quilt set with two other purchases from Overstock: 1) Cotton Blend Poplin Tailored Decorative Pillow Shams (pack of 2) in King Mocha AND 2) Fresh Ideas Poplin 14" drop bedskirt in King Mocha. Made very well, lays well, and looks expensive. Love the color, and everything about this set. Would recommend this quilt set. 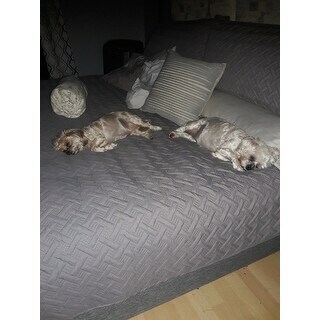 Fair quality but much too small for king bed. I order this item and it was here in 2 days. It is beautiful, and the size and color are great. I will .be telling all of my friends. This quilt is super thin and soft, nothing heavy or good quality. It looks cheap, I end it up giving it to somebody else. So dissapointed with my quilt. The color on this is just so pretty in person. I was concerned the pattern would look too modern but it doesn't. I love the look. It is very light and thin which for me is great. I take it off at night and dont sleep under it. The bed is super easy to make in the morning. Love, love, love! Very nice, textured quilt, super light. I didn give it five stars because it's not as big as the picture depicts. Could be that my bed is a little higher. I like a lot of coverage on the sides. Overall, I really like this quilt. I have 3 dogs who destroy my quilts rather quickly. This quilt is durable, light weight and soft! Washes great and I wish they weren't out of stock so I could buy another one. Really not big enough for a regular king. You need to add a long bedskirt and extra blanket to help cover well. It smells really bad,like heavy paint. Very toxic smelling. I washed 2x's on heavy before smell came out. It's super thin. Provides no warmth. You can see the color of whatever is underneath it. Absolutely love the look of this on our guest house bed. However, when I turned it down the other evening, there was a big circular hole cut out of the lining. Makes me think it was returned for some reason and sold again. Most disappointed in this as I was originally most pleased with purchase. I get really hot at night - and this is a really light weight alternative to my quilt. I wouldn't say that it feels particularly high quality but it does the job and it looks nice. It's about the same weight as a light blanket. Nicely made, attractively low-key. But why I really love is the weight of this quilt set. Not too heavy, not to light. Living in Arizona, I appreciate that it's perfect for year-round use in our guest room! I had concerns the fabric would be stiff, but not the case at all... very soft and so comfortable to sleep under. I love the color as well. Mine is the blue ~ a vintage tone porcelain blue that blends with everything in my room, even green. The quilt set looks better in the illustration. It feels cheaply made and I am not sure of the warmth it will provide. I would have been better off buying a quilt in a department store. The pillows are a nice inclusion. Nice quilt and shams. Color is as shown on line; with the green. They washed and dried nicely. I ordered the Queen set. It does fit the bed, but if you have a very deep mattress and want to tuck in at bottom and sides, it might be a bit small. Happy with product. "Would the king fit a California King?" This will not fit a Cali King. "Do you sell standard pillow shams separately? " We do not sell standard shams separately for this item. "Does the queen get cleaned okay in a standard home washing machine (front loader)?" I have an HE Top load Washer. 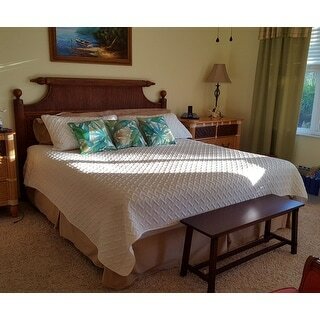 I have washed the 2 twin coverlets I purchased & had no problem. Can't address your question on washing a queen size in a front load washing machine. Yes, I even have a small stackable washer/dryer & it washes & dries nicely. "I'm looking for a grey queen / full size. Can you tell me if there are any available. Although you show a photo of grey it is not listed in the drop down menu. It looks like they have been out of stock since sept 2015 (according to comments)." Unfortunately, the grey is currently out of stock. "I bought a twin quilt in grey but need another pillowcase. Any way I could get one? I placed the order earlier today." We apologize but do not have single pillowcases in stock for this set. "why is this not blue look like gray or some kind of green"
Hello deborah j., if you look through each of the pictures the blue and green are both listed. Thank you for shopping with Overstock! "Hello, would like a grey in king will they be coming back in stock?" Hello Moroccancookie, items are restocked as they become available; however, we cannot guarantee an item will be restocked. Thank you for shopping with us.